Kentuckians are famous for commenting on our unpredictable weather. In case you don’t understand what I’m referring to, imagine a 48-hour period with bright sun, wind, dark clouds, rain, hail, tornados, wet snow ending with clear blue skies. That really happens here. This winter has been mild–to say the least–and I have been crossing my fingers for snow and freezing temperatures. In 2012 we have had temperatures ranging from 15.2 degrees to as high as 70.8 degrees F.
If you are interested in learning about weather across Kentucky, check out the commonwealth’s official source for weather and climate data. 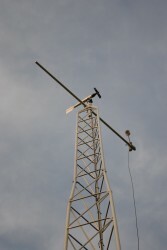 http://www.kymesonet.org. It is through the Mesonet site that the current temperature and conditions at Woodland are displayed on our homepage. 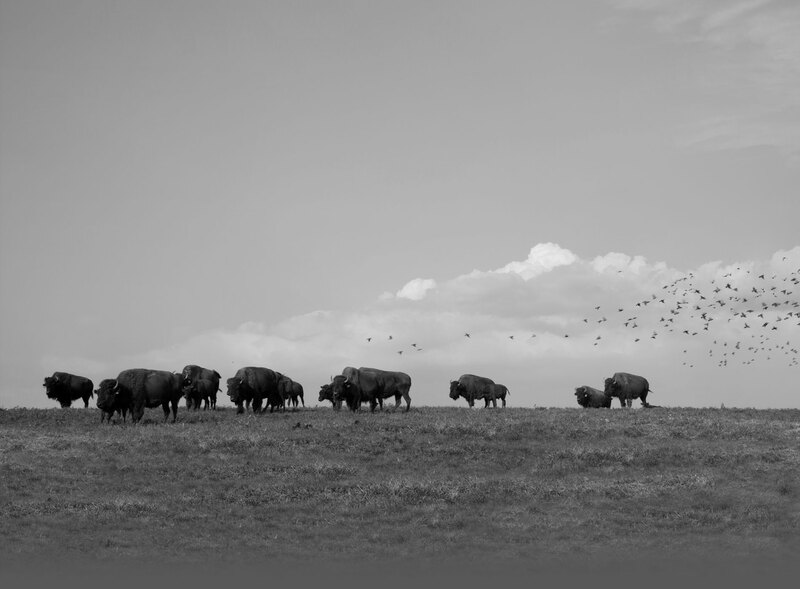 The Mesonet station for Oldham County is located atop a bison pasture. Sunday I went to bed making a mental note of the pictures I needed to make time to take of the different varieties of Crabapple, Daffodil, Hyacinth, Iris, Witchhazel and more. 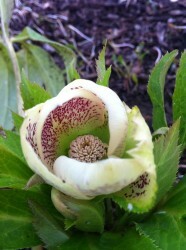 Uploading these photographs is a wonderful way to keep up with bloom time from season to season. Monday morning greeted me with a beautiful blanket of heavy wet snow and a number of voice mails desperately wondering if EVERYTHING IS DEAD! 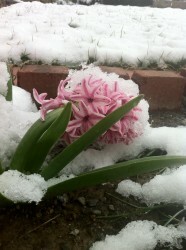 For those that are worried about their flowering bulbs–no need. The snow has melted off at such a rate, it counts as nothing short of a good slow watering. 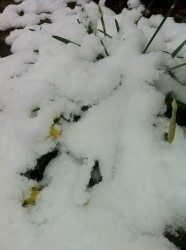 Most of our spring bulbs handled the snow like champs but a few of them looked completely smashed. 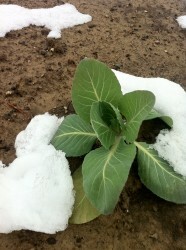 As for the cabbage–I believe it enjoyed the cold blanket. 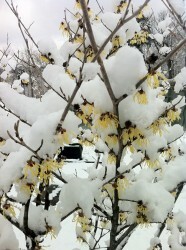 Hamamelis x intermedia ‘Arnold Promise’ is in full glorious bloom. 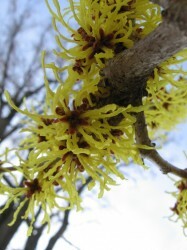 The flowers of this witchhazel resemble perfect lemon zests draped over its rust-red calyx. A deer favorite, it is only in the last few years that we have been able to enjoy this fireworks display. Fencing special plants can be a nuisance and an eyesore but when you are rewarded with blooms like this, it is obviously time well spent. The warm weather has definitely played a part in this early bloom. 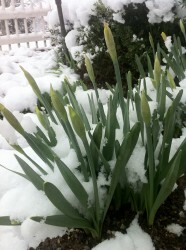 Phenology geeks pay attention as we are 4 weeks ahead of 2010 and 2011. Happy Birthday Ferd & Ella! Today is Ferdinand and Eloise’s 1st birthday. 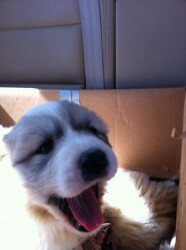 We brought them to the farm in a small box–cute, fuzzy and stinking of puppy breath. Within a few months they had tripled in size and although they were extremely rambunctious they were still cute, fuzzy and stinking of puppy breath. 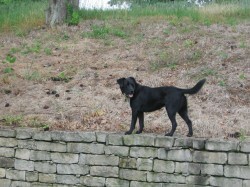 Today, good natured and weighing in around 70lbs–still growing– they are avid explorers and the perfect deer deterrent. There are physical differences but none so strong as the differences in personality. 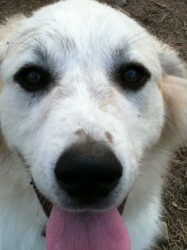 Ella’s thickly coal lined eyes match her more daring and impudent ways. Ferd on the other hand has a more affable nature. 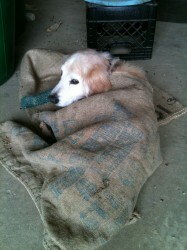 They spend their days lazing on straw beds in the horse barn extracting cockleburs from each others fur. Their nights are spent prowling the property rousing unwelcome visitors. They are welcome companions and will earn their keep well if they keep the deer from browsing in the gardens. By Stephanie Tittle | Posted in Uncategorized | Comments Off on Happy Birthday Ferd & Ella! I believe my friend Natalie was right when she posted “Winter is canceled” on her facebook page. Signs of this are showing up every day. The daffodil and tulip foliage have been peeking up for weeks and the fall planted pansies haven’t stopped blooming. Everyone seems to be enjoying the weather–skipping around on some sort of temperate climate high. I however long for a cold snowy winter. Winter is supposed to be a slow time for planning every last detail of spring thru fall plantings. There will be no time for planning once the ground is dry enough for planting. I need cold weather and a good hard freeze! 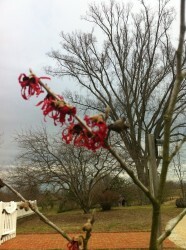 Instead, the Hamamelis x intermedia ‘Diane’ and the Helleborus x hybridus are blooming. 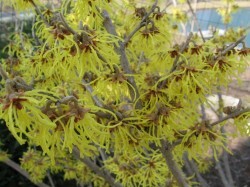 Hamamelis x intermedia ‘Arnold’s Promise’ is showing tips of yellow but I will wait to share a picture until it is near glowing. The only reason I will be able to tolerate a mild February is that the Corylopsis buds are swollen near to bursting. Diane was just planted in 2010 and is still quite small. 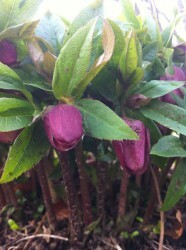 The few flowers it has are spectacular and slightly fragrant–it will be a show stopper. I consider myself extremely lucky, even on rainy days like today, to have the opportunity to work on a farm. Creating a list to explain why is next to impossible as it may never end and I couldn’t begin to rate one item above the other. I am aware and quite possibly in love with something different about the farm everyday. Today I love all of the furry and feathered creatures that great me with what I interpret as a sincere pleasure for my presence. If you haven’t experienced a flock of chickens running full speed toward you from far across a field, well, you surely are missing out on one of the great wonders. Boy can they move. I like to imagine they have something exciting to share, for once we come together they cackle loudly over one another. Not much different than when I come together with my sisters. How about the slow mosey of a couple of French donkeys–approaching with seductive dew drop eyes and curly hair, dipping their heads without a sound, willing you to scratch their jaws softly. Or their miniature field mates that hang back shyly waiting to see if the French ladies find your scratches pleasing. Then there are the steadfast and loyal dogs–Jake, Asheville, Shelby, Eliose and Ferdinand–listed in order of their arrival to Woodland. With great respect, I’ll just say that Jake is old. Everyone in the garden refers to him as The Sheriff. 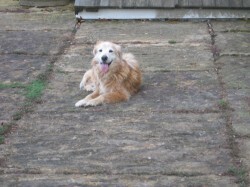 Sort of an Andy Griffith type, overseeing the farm, asking for a pat on the back and a smile. Asheville is much more complicated. A rescue from Asheville, North Carolina, she reserves her affections for a chosen few silently surveying the farm and passing judgement on all–I love her. 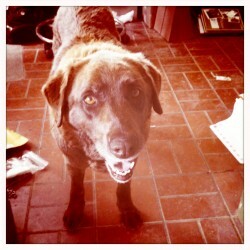 Shelby, well, she’s crazy. A bit like the little old lady that hovers too close but forgets about you as soon as someone else comes along. 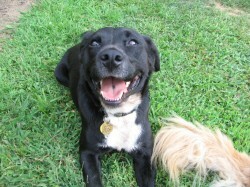 She is sweet and has survived much, i.e., driven over by a trailer. 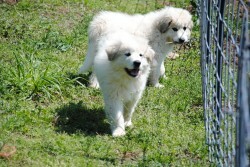 And then there are the pups–Ferd and Ella. They definitely don’t look like pups anymore. Just under 12 months, Ferd weighs in around 75 lbs, followed within 10 lbs by his sister. 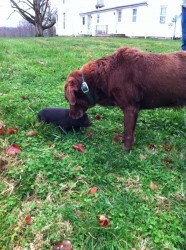 Ella is quickly climbing the ranks to Alpha Queen and it is clear that Ferdinand will support her in her quest. They are sweet and show great promise as guardians against the deer–the gardener’s enemy. Finally no list of farm friends would be complete without a bossy barn cat. Ours is Bobbie. She is not much for cuddling but enjoys a good rough scratch on the back. She makes sure it is impossible to forget to feed her with a good claw drawn swipe. Check back for pics. The temperatures have dipped low enough in the evenings at Woodland that most of our flowers are gone. There are a few dahlias hanging on but definitely fodder for the bees has depleted. We had a few head of broccoli that weren’t harvested and have begun to flower. Whoa! The bees are mad for it! 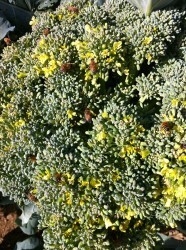 The broccoli head are large –making plenty of room for a number of bees to share the space. I imagine them rushing back to the hive and doing their little bee dance. IF you haven’t had time to clean your garden up for winter, consider leaving a few plants to flower. Phaseolus vulgaris ‘Tiger’s Eye’ is a beautiful bean the color of my favorite crayon–maize. It is decoratively lined with a deep rich burgundy. I love beans for so many reasons, even before eating; they are just so dang nice to look at in mass, and super satisfying to run your hands through. ‘Tiger’s Eye’ is a bush bean that can be eaten fresh or dried. 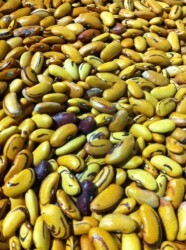 Originally from South America, the skin of each bean is so tender, practically disappearing when cooked. Our Farm Manager, Kristopher Kelley, was lucky enough to have his Grandmother prepare him a big pot of ‘Tiger’s Eye’. He raved about how delicious they were and described them as “meaty”. We grew a limited supply–just over twenty lbs–and they were dropped off at Proof on Main this morning.